CLICK HERE to find out a ton more about the CD, and to listen to tracks on the CD! 2. iTunes Store Individual Songs - $0.99/ea. 3. Amazon.com Individual Songs - $0.99/ea. 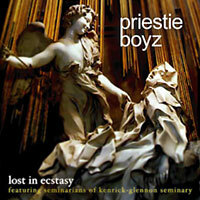 We had an awesome three-show performance of some of our songs at Kenrick-Glennon Seminary During the weekend of February 24th and 25th, 2006! Thank you to the Seminary for inviting us to perform for three packed houses! Thanks to all who watched us perform live at Saint Louis University's Canapalooza, sponsored by the Student Activities Board at Salsarita's (one of SLU's dining facilities) on Monday, November 14th, 2005! We ended up winning first place in the talent show, thanks to our awesome fans! Thanks to all who listened to us at the Crossroads Music Festival on Saturday, September 24, 2005! We'll let you know when your next opportunity to hear us live is coming. Click here to see some pictures from Crossroads. Also check out our blog entries on Crossroads for a first-hand experience.